I have my issues with the next Spider-Man movie being a rehash of the origin story that we got less than 10 years ago, but I don’t take exception to Sony making Peter Parker a teenager again. That was always one of the greatest strengths of the original character, that a person blessed with extraordinary abilities and a drive to help others would nevertheless be in over his head and scared out of his ever-loving gourd on most occasions. Like a teen. Like a kid. A nice corollary to that was the he’d so often interact with other, older and more established character in the hero-ridden New York of the Marvel Universe. Those folks that he’d run into weren’t in on the secret. They couldn’t see through that full mask of his and see the scared kid underneath. All they saw was the super-strong, super-fast web-slinger who could zip around Manhattan like no other. And they couldn’t see the awe that Peter held them in. It was a nice touch. 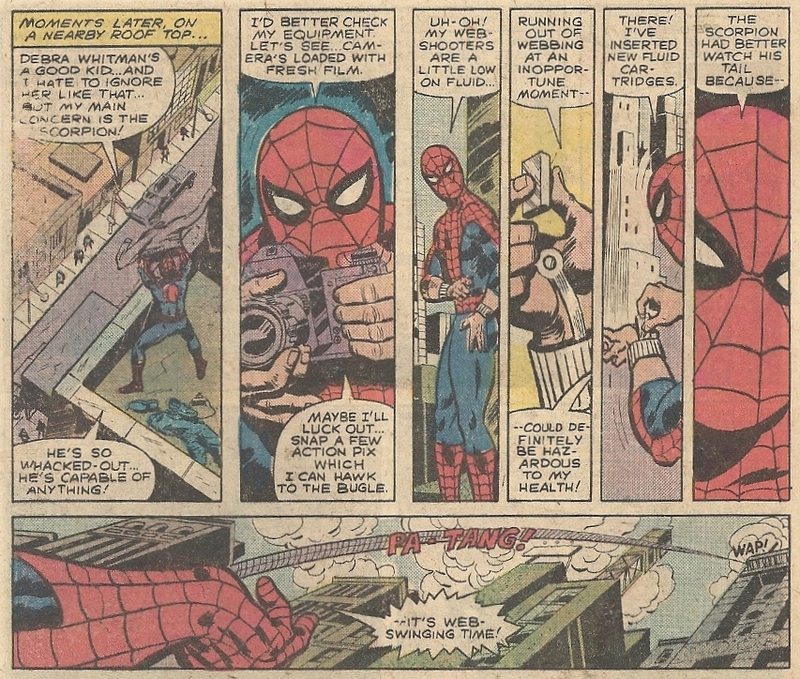 And, depressingly, thanks to rights issues and all that crap it’s something we’re never going to get — at least not for a good long while — with the silver screen Spidey. Oh well. But lovers always have Paris. And fans always have comics. Marvel Team-Up would sometimes saddle us with an underwhelming combo, like Spidey rolling with the Sons of the Tiger. Not in this case. 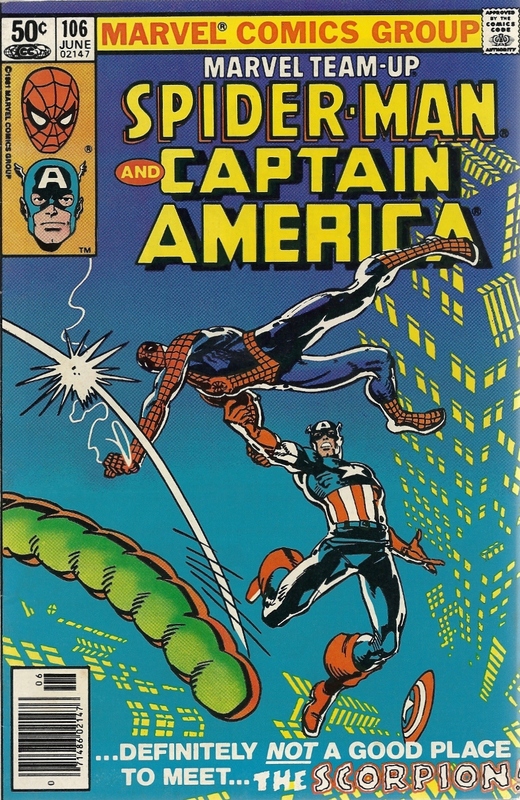 This issue presents us with an encounter between Spider-Man and the hero of heroes, Captain America. 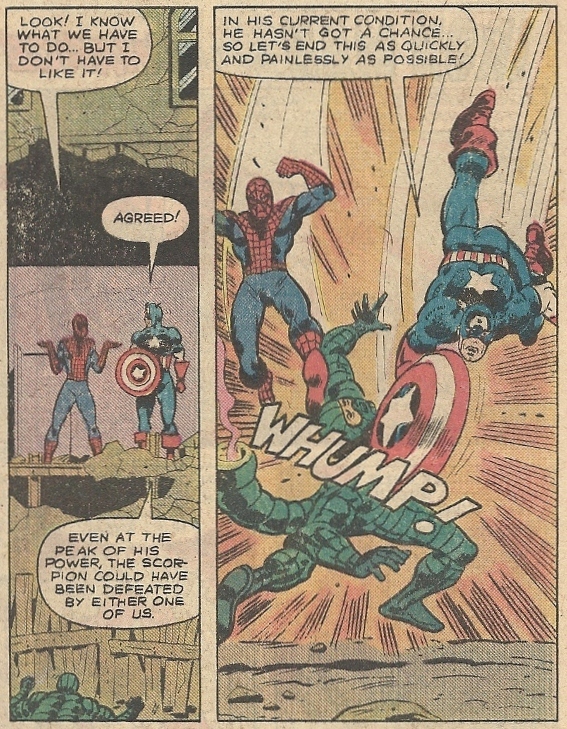 If there’s a guy that could get the wall-crawler all starstruck and stuff, it’s Cap. Kind of reminds me of those doofs that let the “reformed” Joker out in The Dark Knight Returns. This is very much a by the numbers story, but the “son”-drenched interaction between the two heroes makes it a good read. 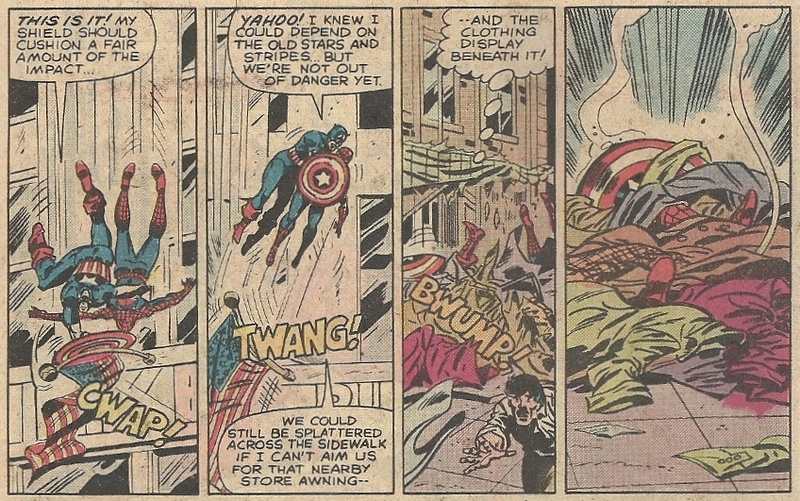 There’s also a rather nice little bit with Captain America telling pissed street vendors with property damage to “submit a bill to Avengers Mansion.” That’s it, Cap — let Jarvis sort it out. 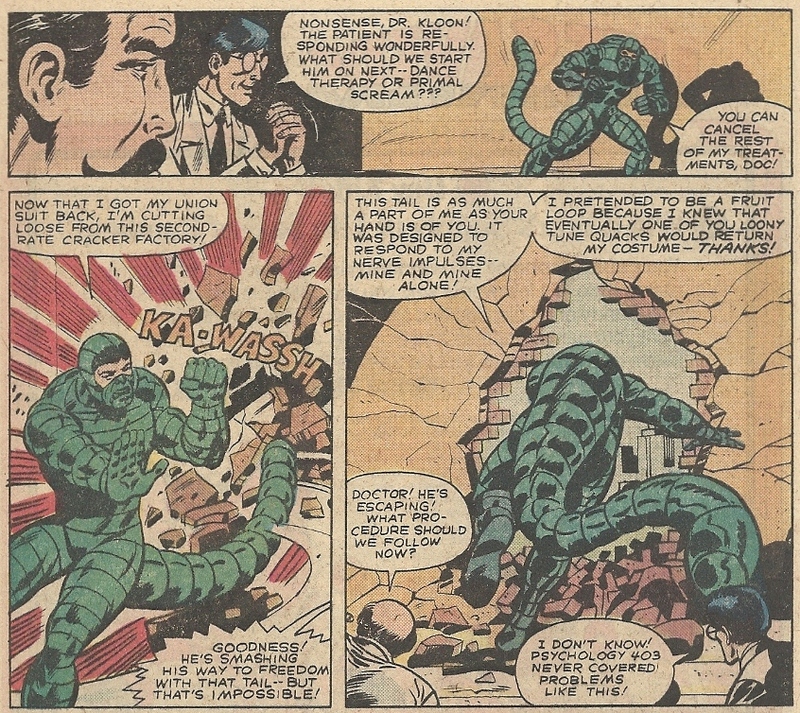 I should also add that, as much as I like Trimpe’s Silver Age art, I’m less enthused about some of his later output. This includes his stuff here. It’s still solid, but there’s a certain stiffness to it that holds it back. Perhaps a disconnect with the inks, I don’t know. 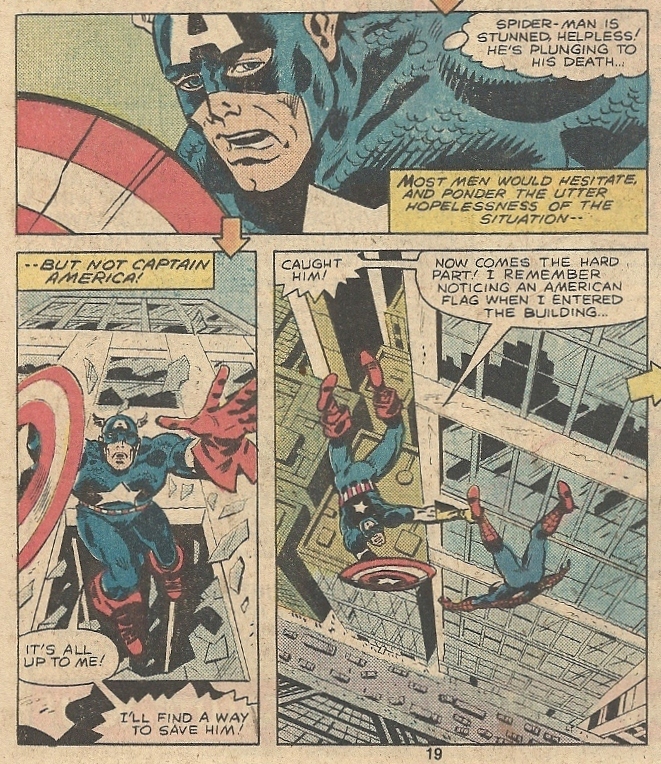 That said, I can’t take anything away from his staging of Cap and Spider-Man tumbling out of a high-rise. It’s a great little sequence. And it’s one that Hollywood may never give us. Make Mine Comics!